Such is the breadth of his work – the mash up of Jay-Z's The Black Album and The Beatles' eponymous double, Gorillaz' Demon Days, Gnarls Barkley, The Black Keys' Attack and Release and his collaboration with Sparklehorse among others – that Brian 'Danger Mouse' Burton is one of the few producers whose next work is awaited with a well justified sense of anticipation. Clearly a music lover, Burton is a man whose deft touch adds a conviction that is both convincing and heartfelt. 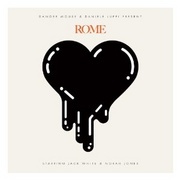 His latest project, Rome, is a collaboration with Italian composer Daniele Luppi that doffs its hat to the work of Ennio Morricone and the Italian movie soundtracks of the 60s and 70s and is the latest in a long line of projects that confirms his status as an aural auteur without peer. Recorded over a five-year period on a analogue equipment and using many of the musicians who appeared on the soundtracks to Sergio Leone's The Good, The Bad And The Ugly and Once Upon A Time In The West, Rome takes the methodology of the days of yore to create something that is both contemporary and timeless. The result is one of the most sumptuous and beautiful albums to have been released this year. Steeped in retro xylophones, lush string arrangements, plucked bass, hints of psychedelia and clipped guitars, the cool waves emitted by this collection evoke long summer days, open top sports cars on winding mountain roads and Martinis at sunset. But the album is far from being an exercise in nostalgia as it manages to throw up a number of surprises from a couple of unexpected sources. Jack White's vocal gymnastics are wisely kept in check and his restrained and measured contributions provide one of the album's many pleasure and none more so than on the delightful 'The Rose With The Broken Neck'. But perhaps the biggest surprise comes from Norah Jones who sounds liberated from the jazz-lite that made her name. 'Season's Trees' smoulders with a glowing intensity as elsewhere 'Black' becomes the album's highlight courtesy of the combination of a convincing performance and a knowing familiarity that is instantly accessible. Rome is far from being pastiche or an exercise in recreating the sounds of yesteryear. Burton and Luppi have taken a template and used it as a foundation to evolve a sound and mood that stands up to scrutiny on its own terms and in between puffs of cheroots comes the sense that the next Danger Mouse project can't come quick enough.